Installation – Summit Anchor Co.
What’s the purpose of anchorages if they are improperly installed? Even the highest quality manufactured equipment fails to provide a safe suspended maintenance system if not properly installed. Summit Anchor Co. takes pride in properly installing anchors for a safe suspended maintenance system. Our installation team is well-trained, ensuring proper installation of the fall protection system. We pride ourselves on ensuring that the final product is neat and aesthetically pleasing. For example, our anchor installers make every effort to install anchors in a straight line parallel to the building edge with anchor eyes facing the same direction. Can Summit Anchor install anchorages on currently occupied buildings? Sure, we can! When retrofitting an existing building, we know that tenants want noise and disruptions kept to a minimum. 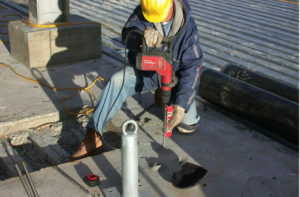 Summit Anchor uses low vibration, low noise drills that are ideal for use in occupied buildings, or we can schedule installations during non-working hours. After system installation, Summit Anchor tests each product to ensure that it safely supports the required load and submits a written test report to the customer. (See Load Testing).